Widely acknowledged as the best hockey book ever written and lauded by Sports Illustrated as one of the Top 10 Sports Books of All Time, The Game is a reflective and thought-provoking look at a life in hockey. 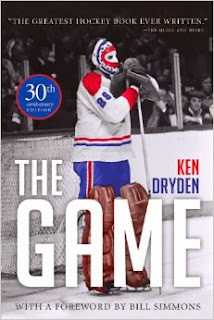 Ken Dryden, the former Montreal Canadiens goalie and former president of the Toronto Maple Leafs turned politician, captures the essence of the sport and what it means to all hockey fans. He gives vivid and affectionate portraits of the characters—Guy Lafleur, Larry Robinson, Guy Lapointe, Serge Savard, and coach Scotty Bowman among them—who made the Canadiens of the 1970s one of the greatest hockey teams in history. But beyond that, Dryden reflects on life on the road, in the spotlight, and on the ice, offering a rare inside look at the game of hockey and an incredible personal memoir. The new chapter discusses the tradition of NHL players from the Stanley Cup-winning team having the opportunity to take the Cup home. Surprisingly, this tradition didn’t start until 1995. Having never had the chance to take part in this custom, Ken petitioned to have the opportunity to do so, and when his request was finally granted – he celebrated his success in a big way. In this celebration he was able to have with his family, Dryden expertly ties together themes from his original text from 30 years ago to today's audience. Themes such as how hockey is about so much more than sport, but rather it is about community, and family and Canada. It is the national narrative, whether it is played out in the big NHL arena's, or in our own backyards. The new chapter in The Game: 30th Anniversary Edition is just a few pages long. It was the first chapter I read in the new re-released offering and I was instantly taken back. I was immediately reminded why The Game is arguably hockey's greatest book, and why Dryden is possibly hockey's most fascinating person and most gifted writer. Instantly I knew I had to re-read this 30 year old book that I have read a few times before, something I wasn't really planning on when I agreed to do this review. I am so glad I did, because this timeless classic is such an amazing read. And now it has a whole new spectacular ending to it.